An engagement would be almost incomplete if there is no exchange of a diamond engagement ring between the couple. A diamond ring is a symbol of an enduring and everlasting love between the couple. Thus, to make your engagement successful and utterly memorable, it is necessary for you to get an excellent diamond ring for your engagement. So, here comes a task to choose one diamond ring for your engagement. And the task would not be so easy. It’s because most people do not have much an idea about how to get a diamond engagement ring. Therefore, here we have listed some of the most popular diamond rings, whether they are classified by cut or by setting, from which you can choose for your engagement. The round-cut diamond is the most common and popular choice. A round-cut diamond engagement ring fits perfectly for a majority of women. A diamond with such a cut and shape produces a dazzling brilliance. Because the size is utterly simple, it is the classic and timeless choice for most diamond engagement rings. A round-cut diamond that is placed in a four-prong setting will enable it to sparkle even more brightly – it’s always an iconic look and women love that. Round-cut diamond rings simply never go out of style. A princess cut diamond ring is made especially for brides. A square or rectangular diamond is fitted in gold or platinum setting that makes this ring stunning and elegant. We can say that this is the most “ladylike” type of ring that is perfect for certain occasions such as an engagement. Usually, yellow, pink and blue color is preferred in a princess cut diamond ring, but the classic colorless diamond is also perfect for this kind of cut. You may have heard about those rings where more than one stone is fitted. The three-stone diamond engagement rings are very popular due to their elegant and exquisite look. In such a ring setting, a gemstone is set on the center of the ring while the two smaller gemstones are fixed beside the center stone. People believe that the three stones in this ring symbolize good past, present and future. In a ring with a three-stone setting, you can have all diamonds or a big diamond on the center and two other gemstones fixed on its sides. That way, it will give your ring an attractive contrast of colors. One of the advantages of the three-stone setting is that it makes for a good introduction to a mix of gemstones. Of course, a three-stone ring is more expensive than the standard one-stone ring, so if you and your fiancee are settled on that design, you should set a considerable budget for it. The pavé (pah-VAY) ring is also a popular choice. This type of ring setting is characterized by the surface of the ring that is covered with smaller beads of gemstones, set closely together, for that endless sparkle. You can choose any kind of gemstone of your choice, but obviously the most popular gemstone for the pavé setting is diamond. If you can afford it, why settle for just one stone when you can have the entire row of diamonds for added brilliance? Like you would with a three-stone engagement ring, you can also mix different gemstones of your choice in the pavé setting. As expected, the pavé ring is quite expensive as it is studded with lots of gemstones. Bezel is also a popular choice because it combines style and practicality in one setting. The center stone is fully or partially encircled by a custom-made bezel (a band of metal) to hold the stone securely in place. For women who have an active lifestyle, an engagement ring in a bezel setting is the most feasible choice because the center stone won’t fall off or suffer scratches. Bezel is one of the earliest known techniques of stone-setting, so a ring with a bezel design displays a chic and modern look, or a beautifully vintage appearance. It is also easy to maintain. In case you are truly confused with those ready-made diamond rings in the market or you are still not satisfied by the designs of ready-made rings, then you should go for a designer diamond engagement ring. You can go to a reputable jeweler and ask him to design a diamond ring as per your own specification. Which means that you can order a new and unique engagement ring with the designs that you have specified to the jewelry maker. A good designer can make a ring which exactly follows your desired design, as well as your choice of gemstones and metals for the band. Thus, this way you will be fully satisfied with the design of your diamond engagement ring. 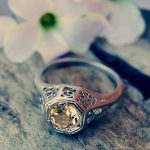 You can follow the hottest ring design trends to get an inspiration. But it is always better to derive your design inspiration from your girlfriend’s preferences in clothes and jewelry, as well as your happy past experiences with her. That will give your customized designer ring a unique design and a more personal touch. If your sweetheart wants it, you can also have her name engraved in the ring to ensure that this ring will certainly be hers, and hers alone. Depending on the design you have provided, the setting, the number of gemstones and the type of metal that you have chosen for the ring’s band, customized rings may be more or less expensive than the ready-made ones. When considering for a customized designer ring, you have to start early and save early. It is also important to look for a reputable jeweler who will craft and design your ring. The more reputable a jeweler is, the more likely that you will entrust your ring design to them. A reputable jeweler will craft an engagement ring that has the exact design that you have envisioned. One of the good things about customizing your own ring is that you will be able to express your preferences, your feelings and your creativity, and you will put all of them into the creation of your own uniquely-designed diamond engagement ring.